KIEV, Ukraine -- The Organization for Security and Cooperation in Europe (OSCE) plans to double the number of monitors it has in Ukraine by the end of this month. Ukrainian prisoners of war sit in a truck during their transportation to a place of exchange for pro-Russian rebels on December 26. OSCE spokesman Michael Bociourkiw made the announcement on January 4 in an interview with the German dpa news agency. The monitoring mission will be increased from 250 monitors to 500 because the security situation in eastern Ukraine has improved, Bociourkiw said. He added, however, that there continue to be violations of the fragile cease-fire on a daily basis. He said the withdrawal of heavy equipment that was agreed by all parties in Minsk in September has not been implemented. Both Ukrainian military officials and spokespeople for the pro-Russian separatists in eastern Ukraine on January 4 accused one another of violating the cease-fire. The separatists said their positions were shelled 16 times by Ukrainian forces "using tanks and heavy artillery." The Ukrainian military said its forces had been shelled 10 times overnight. Three Ukrainian troops were reported killed. More than 1,300 of the deaths have come after the cease-fire deal, and efforts to build on the agreement have made little progress despite a decrease in fighting in recent weeks. Russian news agencies cited Deputy Foreign Minister Grigory Karasin as saying on January 4 that Russia would take part in talks in Berlin on January 5 with representatives of Ukraine, Germany, and France. The leaders of those four countries -- which have been at the center of diplomacy over the conflict in eastern Ukraine -- are to meet in Kazakhstan on January 15, and their foreign ministers may meet later this week. Karasin said Russia would be represented at the Berlin meeting by Viktor Sorokin, the head of the Foreign Ministry department responsible for relations with Ukraine. "We must do everything we can to secure their immediate release," Poroshenko said. National Security Council head Oleksandr Turchinov said at the same meeting in Kiev that it will only be possible to cross the military control line around the zone where the government is fighting against separatist forces at seven designated crossing points. Also on January 4, the separatist "human rights commissioner" Darya Morozova of the self-proclaimed Donetsk Peoples Republic (DNR), Darya Morozova, said the separatists are conducting negotiations with the Ukrainian authorities on arranging a possible prisoner swap. She gave no details about where the talks are being held. Morozova said the separatists are holding about 30 Ukrainian service personnel, and added that she estimated Ukrainian forces are holding about 220 people from the DNR. 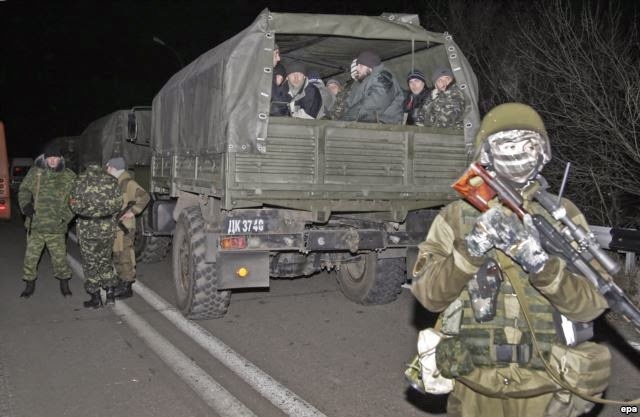 On December 26, the two sides exchanged 149 Ukrainian service personnel for 222 detained people from the separatist areas. Separatist leaders in Donetsk on January 4 reinstated a curfew that had been temporarily lifted over the New Year's holiday. Under the curfew, "legal and semi-legal entertainment establishments" must be closed by 10 p.m. Anyone found on the street after that time in a drunken state or without documents is subject to detention, the separatist Donetsk News Agency reported. Russia's Emergency Situations Ministry announced that a "humanitarian aid" convoy of some 60 vehicles has left the Russian city of Rostov-on-Don for Ukraine's Donetsk and Luhansk regions, where the rebels hold the provincial capitals and other territory. It is the 11th such convoy Russia has sent to Ukraine in recent weeks. Russian officials said it would reach the Donbas on January 8.